If you’re still longing for a little outdoors before the cool of fall sends you scurrying for a nice knitted afghan quilt inside, hold onto a little bit of summer with a final cookout--grilled pizza. It’s way way way too fantastic to miss. Hey, if the chill is already threatening, there's no reason not to don a parka and load this baby up with plenty of crushed red pepper. Consider it your no-fail body-temperature-raising technique. 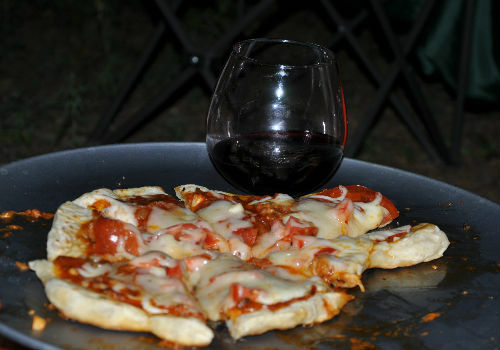 During a recent weekend getaway at the cabin, I took up my new Emile Henry glazed pizza stone, which can withstand the direct heat of a grill fire, whipped up some of my favorite super easy dough, jazzed up a bottle of sauce and got busy. 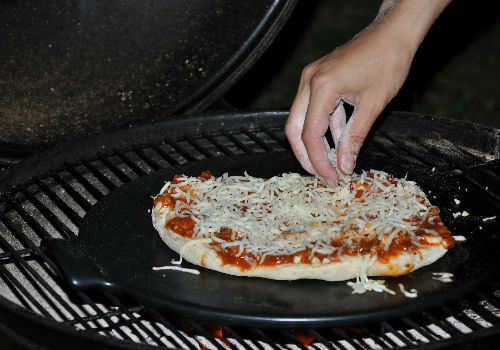 Making grilled pizza is a great group activity. You have to work quickly once the dough is on the heat, so our little group split up the tasks and strategized our pizza-making choreography--which was quite the dance. Nate had the tongs to tend the dough, I had the olive oil, garlic and sauce. 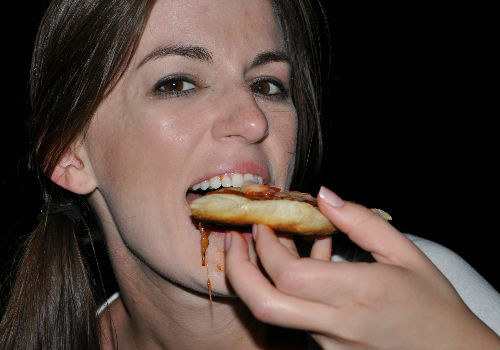 Kate was on for cheese and pepperoni. And of course, the handsome TK captured everything on film. We opted for simple toppings -- just pepperoni, with some extra sausage in the sauce -- and I don’t recommend too much more than that (although I’m a fan of experimental toppings any other time). The magic here, though, is less in a plethora of toppings, and much more in getting the crust just right and eating it piping hot after sliding it off the grate over a coal or wood grill. Mix together the ingredients in a bowl. Automatic machines are nice, but I made it with nothing more than a wooden paddle and a bowl. Once the flour is completely incorporated, continue stirring/kneading 5-10 minutes. If you make it a day in advance, don’t worry about kneading too long. Letting it rise and rest in the fridge will do most of your work for you. 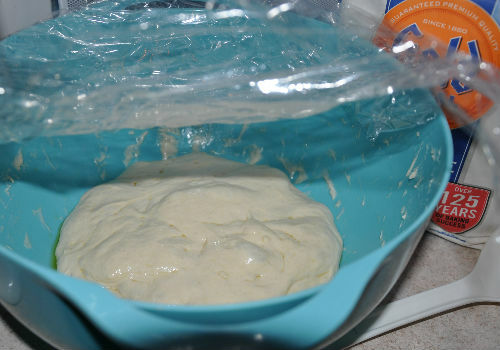 Cover the dough with plastic wrap and let rise at least 2 hours. Saute the garlic and onion in olive oil until soft, then add in the hot pepper and saute for another minute or two. Dump in your jar of sauce, dribble in some red wine if you have it on hand, stir in your fresh herbs, then cover and simmer on med-low heat for at least 20-30 minutes. The best way to roll out your crust is to think of it as a process of teasing out the dough. You are working against the gluten here, so when it feels like you’re straining against the dough’s stretchiness, let the dough rest and the gluten will relax. Start with a ball of dough the size of a large orange. Sprinkle the dough and working surface with a light dusting of flour. Pat the ball into a flattened circle, give it a rest, then continue working it into a thin crust. My first of three crusts was the best because I gave it enough resting time so as to allow me to work it into almost a paper thin crust. On the grill, that crust crispened right up to perfection. 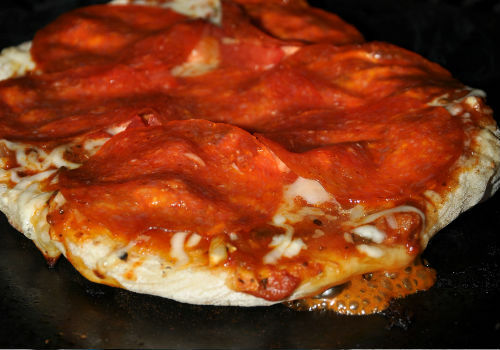 If you have parchment paper and are planning to grill on a pizza stone, roll your dough onto the parchment and then you can scoot the pizza crust and parchment directly onto the stone altogether. Otherwise, roll out your crust on a well-floured cutting board or pizza peel and either scoot it quickly onto the grate or pick it up from the four corners and lay it gently out on the grate. You have to work quickly because the dough becomes quite flimsy when it’s heating up. Finishing off your layering with cheese, like a normal pizza, definitely was the worst option. Because you’re eating the pizza so immediately after cooking, the melted cheese is particularly unmanageable. Better was finishing off with a nice, solid layer of pepperoni, which served to hold all the “guts” of the pizza together. For more recommendations, check out our Zappy Zins with Pizza wine list in our app for the Windows 8 phone.